I visited Plant in late 2014. Their menu changes from time to time, so you can check the menu online before your visit for their current offerings! A few years ago, I was talking to my best friend on the phone, and she started gushing about this all-new 100% vegan restaurant that opened up in her town called Plant. Soon after she told me about it, I started to hear all the buzz from the vegan community. “You have to come visit soon,” she said. She says this every time we talk, but the way she said it this time made me think I was in for something really special. Well, it took me a few years to get down there, but it was so worth the wait. I can’t believe how nourished I felt while eating, how full and happy I was post-meal, and how I was literally and unintentionally mmmm’ing out loud (which could be embarrassing to some, but their food was that good, so whatever). The food was plated very beautifully and artistically, and I loved how they pieced each dish’s components together to create a truly unique taste experience. I think you will see why this is one of the best restaurants I’ve ever eaten at. We started off with two appetizers: the [Plant] Cheese and the massaged kale salad. [Plant] Cheese was a cheese plate with aged cashew cheese, farmer’s involtini, rosemary amber and fruit, red wine peppers, black garlic oil, and focaccia. Cheese plates are a new thing for me. I was never into dairy cheese that much, and I don’t live near any restaurants that have vegan cheese plates. 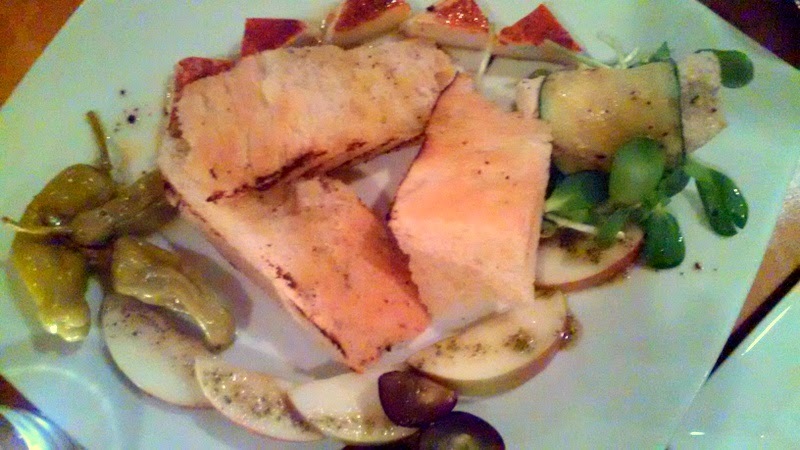 The cheeses were so creamy and rich in umami, the focaccia was perfectly airy on the inside and crisp on the out, and I loved the herb and oil drizzle that was on the apples. It was a really enjoyable dish to share at the start of our dinner. 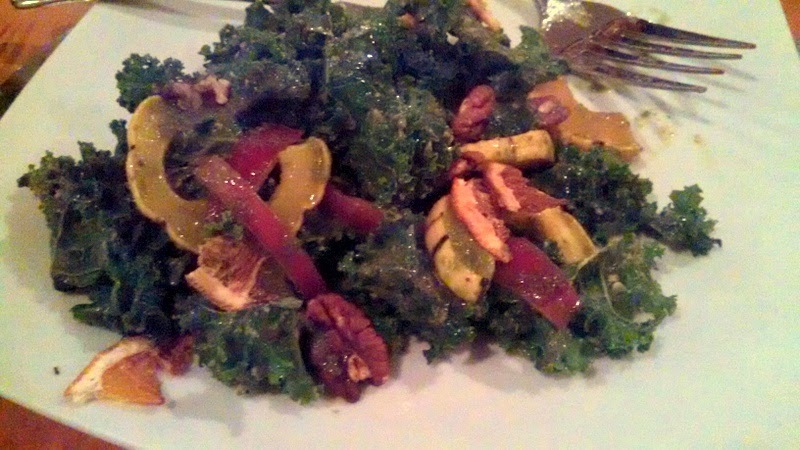 The Massaged Kale Salad contained roasted delicata squash, grilled red onion, candied orange, pecans, and an herb-sherry vinaigrette. It was a brilliant starter for me. I love to have a generous helping of greens with my meals, so while I shared this with everyone at the table, I ended up eating most of it. It was bright, full of complex flavors, but not too over-the-top. The herbs were just enough to add to the complexity of the flavor without taking over the more subtle flavors of the vegetables. The candied orange was my favorite addition; it was bold and sweet in a natural way. Does that make sense? For my main, I ordered the Chicken O’ The Wood Apricot Adobo. This is the dish that made me go all Harry Met Sally on it. 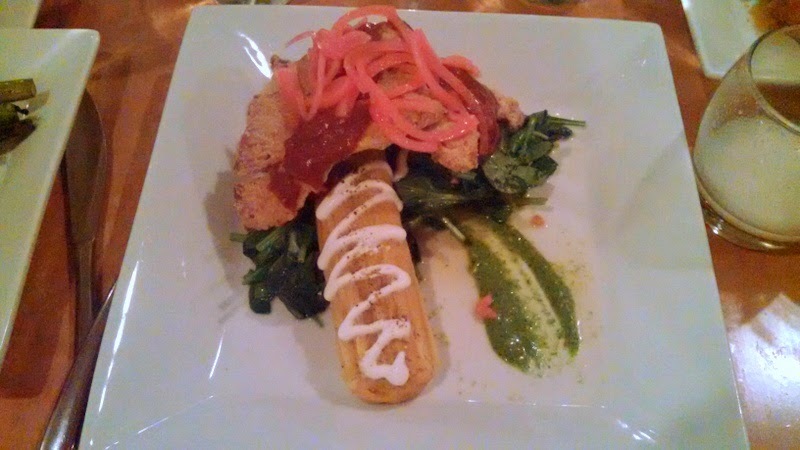 It was breaded Chicken of the Woods mushrooms (yeah, it tastes like chicken) smothered in apricot adobo sauce with a poblano-stuffed tamale, sauteed spinach, olives and chili, cilantro mojo, pickled onion, and sour cream. I hesitated to choose this entree because it was the most expensive dish on the menu. If you find yourself dining at Plant and have similar reservations, I’m going to offer you this advice. Just do it. This dish was worth a million bucks. 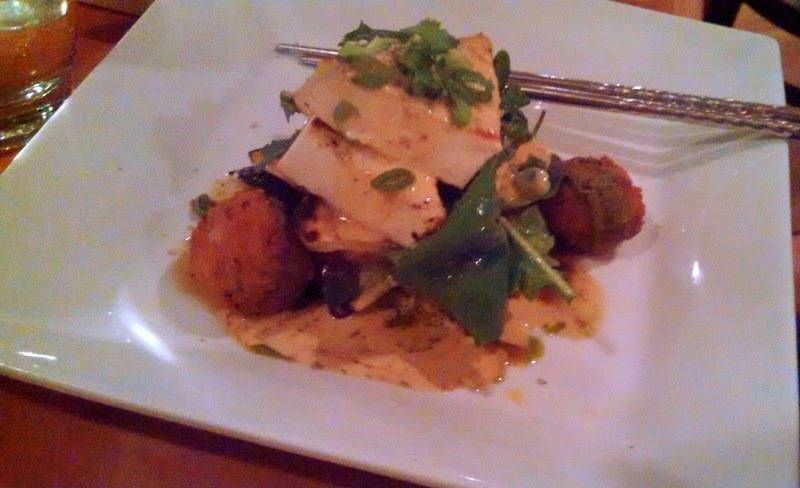 My bestie ordered the Red Curry Tofu which came with jasmine rice and kaffir lime cakes, thai basil, arugula, and teriyaki green beans. The galangal curry sauce was amazing. It’s one of the better curries I’ve had. 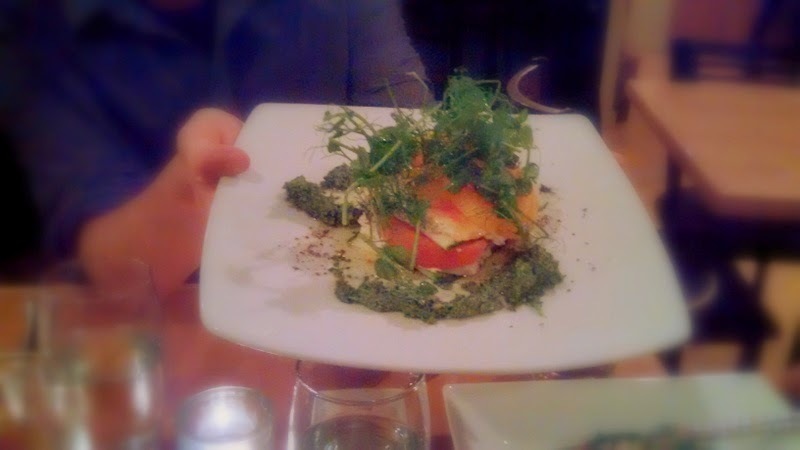 My bestie’s partner ordered the live lasagna with heirloom tomato, peppercorn macadamia cheese, marinated red pepper, radish green and pine nut pesto, pea tendrils, and lavender-infused oil. I had a bite and really loved it. I’m a sucker for macadamia anything and a lover of raw food, so yeah, naturally I loved it. My brother, who is anything but an adventurous eater, ordered the Frites Plus Mayo (hold the mayo) and a side of broccolini. I gave him (someone who doesn’t care for most vegan food) the same suggestions I give to vegans who are going to a vegan-unfriendly eating establishment. Look for sides and/or components of main dishes that can be ordered separately. 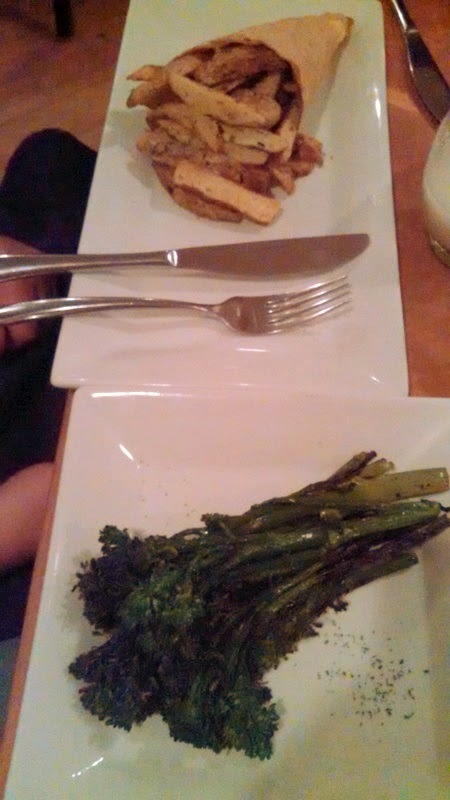 The Frites was a side that they offer already, and the broccolini was served alongside an entree. He asked if he could have a side of it and they kindly obliged! I didn’t try the Frites, but everyone else at the table did. They all said they were the best fries they’d ever had. Are you noticing a trend with our impression of Plant’s food? For dessert we got the Cannolo with handmade anise shell, candied orange ricotta, chocolate puddle, and mexican chocolate ice cream. I’d been anticipating this dessert since I had first looked at it on the online menu. Can you tell by the swiftness that I dug into it?! 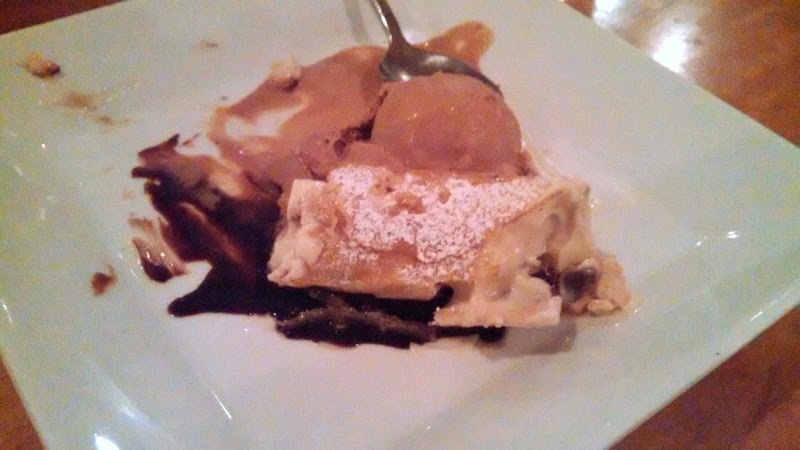 The ricotta was really amazing, and I’m wondering if perhaps they used macadamia nuts in that. There is a sweetness about macadamia nuts that other nuts just don’t have. I wish I could’ve taken a whole crate full of these home with me. Just thinking about it now, I want to get in my car and give my friend a surprise visit (“and hey, while I’m here, let’s go to Plant!”). Also, we tried the trio of ice creams. We chose cookies and cream, coconut cake, and lemon thyme. Can I just say this is the best vegan ice cream ever? The taste, texture, and flavor balance were on point. I like ice cream, but I always have a problem with them being too sweet. 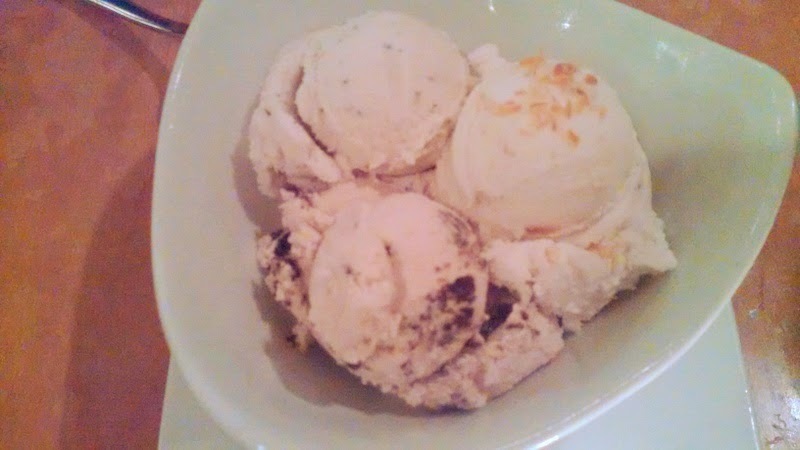 These coconut-based ice creams are pleasantly sweet, a mark that the recipe developer really understands their craft. When you’re working with foods high in fat content, you really don’t need to add so much sweetness. Creating food is always a balance; you want the tastes in harmony. This is what they do with their ice cream perfection. Of the above flavors, the lemon thyme was the standout, we all agreed. My best bud and I both brought home some leftovers. I like to bring containers to restaurants in case of this, but I didn’t bring one here. The container they gave me was compostable. Yay! They even had compost bins in the bathroom, so you can see that they have a serious commitment to environmental concerns. Oh, little hippie town Asheville, I love you so much! All in all, it was a memorable night in the company of wonderful friends. I’m eager to return (hopefully sometime soon! ), but until then I whet my appetite with their mouthwatering Instagram pictures!